When the quality knob needs to go to ELEVEN. Enotools is your source for Carlsen's vibratory sorting tables for your whole cluster, pre- destemming or post- destemming needs. 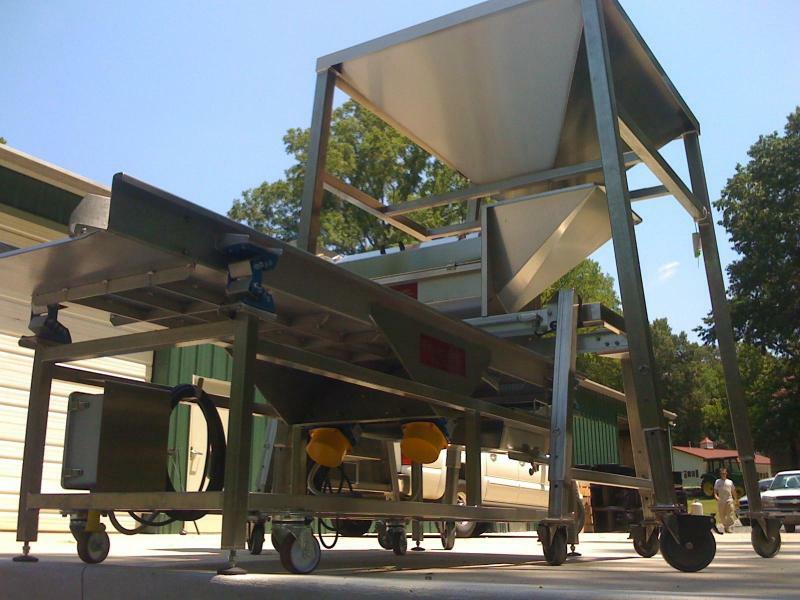 We have a few crush equipment options for overhead or incline receiving hoppers and crush rollers mounted after the sorter for use with bins or TranStore tanks. The system can also be configured to receive, destem, sort, crush, then pump to a large fermentor. Your happiness is our goal and we promise to provide the same quality and service on even one- off projects! We need to discuss your harvest technique, the size of your harvest, and how the grapes are handled to make sure that we should or should not recommend other pieces of winery equipment to include with your sorting table. Please click to start a dialogue on your wine grape sorting needs. 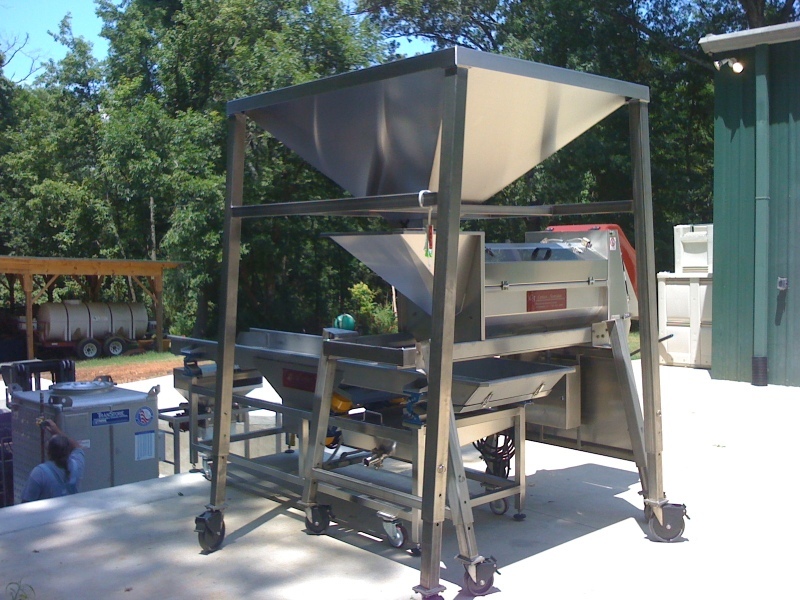 Your Carlsen Receiving Hopper will supply a metered feed of fruit to the Vega series Destemmer, or whatever other brand of equipment you may be using. This allows you to choose the perfect rotation speed to get the result that you want from the bunches of grapes. 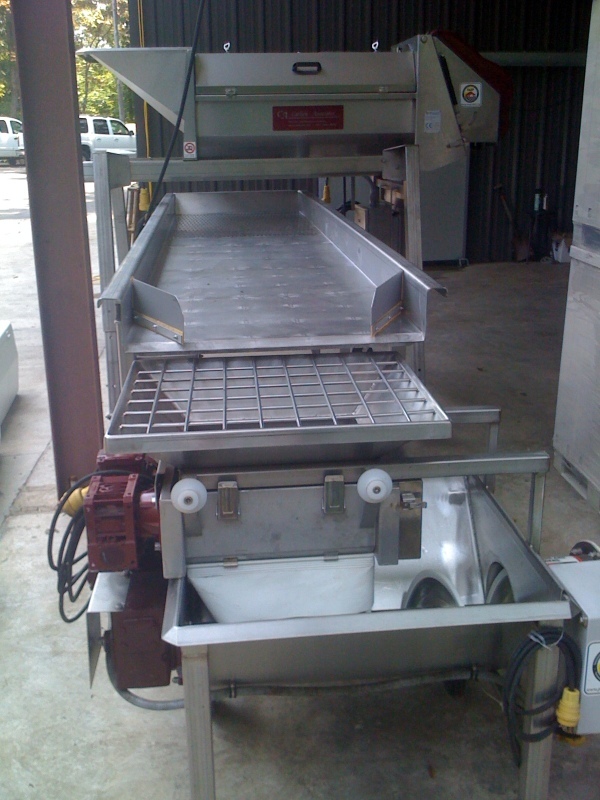 The destemmer has an American made stand which adjusts to position it above the vibratory wine grape sorting table, which in this photo discharges into the crush rollers to gently break the skins or not break them at all. This application also depicts the use of the gentlest must pumping system on the planet, but could easily discharge into bins or satellite tanks for dumping into the fermentor. 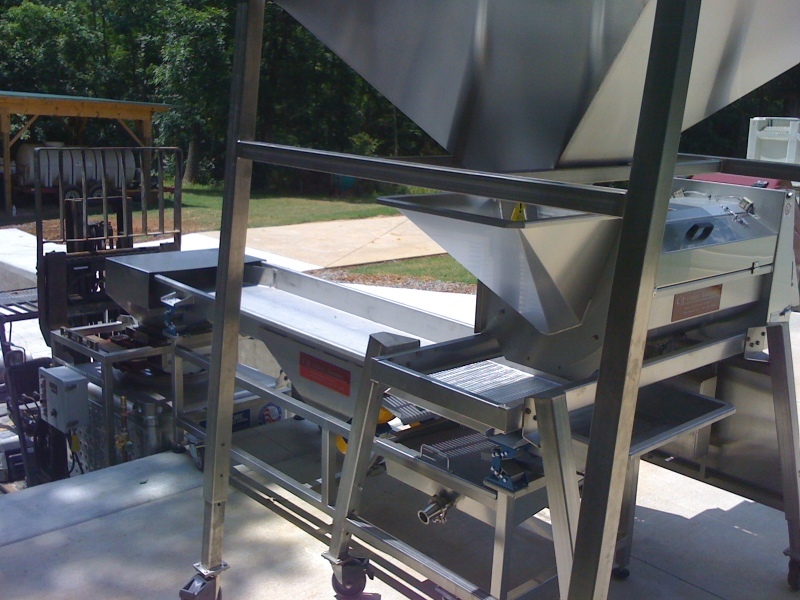 Above, see the second means for processing grapes at Little River Winery in North Carolina. Will Russell wanted a way to sort reds and gently break the skins just before they fall into the TranStore combination tanks used here for fermentation vessels, then storage or blending.